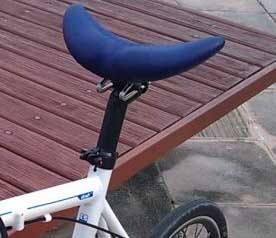 Sitting on a bicycle saddle can cause coccydynia in some people, or make it worse. On the other hand, I find cycling much more comfortable than driving. You may be able to enjoy it if you use the right position and saddle. But if cycling causes your condition to get worse, avoid it. Position - adjust the handlebars so that you lean well forward, taking the weight off the tailbone. 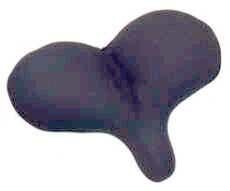 Saddle - ones with a cut-out under the coccyx are available (thanks Linda). 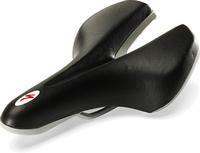 Specialized make various models of saddle, including ones with coccyx cut-outs. They are available in many cycle shops, and a fitting service is available to make sure that the saddle is right for the spacing of your sit-bones. I (Jon) have tried the Spongy Wonder, and it worked, in a way. 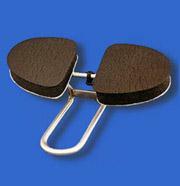 It put no pressure on the coccyx area, but it was harder to cycle with than an ordinary bicycle saddle. I didn't realise until I tried the Spongy Wonder that the 'nose' of the saddle, that goes between your legs, helps keep you stable on the bike. If you ride with this kind of saddle, with no nose, and take a hand off the handlebars to signal, you feel as if you're going to fall off.